Ok, I had a crazy idea of setting off a 2 o’clock in the morning and riding to Greenport then grabbing breakfast somewhere on the way back. As I was still up by 10:30pm, I decided to change that to 3 o’clock instead. I was pretty much set up so I thought it would just be a case of getting riding gear on and out the door. It still took me half an hour! Having the two lights on the front makes a big difference. The dynamo is definitely the brightest of the two but the Niterider has a wide beam and lights up a big area. They complement each other well. The only problem is the Niterider has a rechargeable battery and will only last 3-4 hours. I wonder if I can run it off the cache battery for part of the night. The Garmin can have half the night and the Niterider the other half. That may just work and then I can charge the cache battery up once daylight comes. Sounds like a plan. I saw a fox on Nichols Road. It is only the second fox I have seen in this country despite being here ten years now. It ran gracefully across the road but with purpose. Not the frightened run of a squirrel. Majestic. I also passed three youths walking home from a party, perhaps. When I got on to Rt-347, the traffic was intermittent. I did think about the stats of when the most cycling fatalities are in Suffolk and hoped that everyone on the road would be driving sensibly. Only one driver honked his horn at me. I was very visible from the rear with my two red lights and reflective ankle bands. As I reached the Rocky Point bypass, the streetlights disappeared for the first time. I felt like I had been transported on to a night dive with my headlights acting as my main beam in the water. It was peaceful, it was still, it was nice. Visibility was great!! Dawn broke at around 5am and then the sun crept over the horizon some time later. I reached Greenport after 3:12 hours of cycling – 53 miles. The metal bird has disappeared. Not sure if someone took it as a souvenir but it is definitely gone. I was going to take a photo of it. as it was, I just tweeted that I had arrived. I poured the fresh water from the back up bottle to the main one and slipped in a Gu tablet. I set off for home, looking for a place to have breakfast on the way. At Riverhead I stopped to buy a big water bottle. I filled both bike bottles and drank a bottle of cranberry juice. That was nice. I continued on, still looking for a breakfast place. I didn’t want a chain and was almost resigned to eating at JT’s in Nesconset. I then passed two possible places but I didn’t stop. Mainly because I had just replenished supplies at the 7-Eleven and it felt too soon to stop again. Two cyclists caught me up and we chatted about how far we had gone. They had done 40 miles or so. I told them I had done 80 and that I had been to Greenport and was now on my way back. They seemed impressed. Once I reach Sound Avenue it starts to become really familiar and it doesn’t feel like too far to go. When I reach Rt 112 it almost feels like I am home though there is another ten miles to go. As I approach Lake Avenue, there are no cars behind me so I move into the left lane and wait for a gap in the traffic. The lights turn red, then green but I have not triggered the sensor and I don’t get the left turn light. I wait for the oncoming cars to pass by and then take the break in traffic to cross into Lake. I enter the parking lot of JT’s only to find people waiting to be seated. After cycling 100 miles, I am not going to wait for a seat. I head out of the parking lot and cycle home. I averaged 16.5mph heading out to Greenport and 14.4mph coming back. There was a slight head wind coming back so that goes towards explaining why I was slower. I also felt tired in my legs. Not my thighs but my calves. That’s interesting because when I do the CTS workouts, it is always my thighs which ache. The new rear bag seemed quite well though when I stand up to attack a small climb, it does end up shifting to one side or the other. It is not a big deal to move it back into place. I don’t want to tighten it any further as it is a carbon fibre post. I can definitely get some stuff in it. Overall, a good ride. And now I have to do another hundred tomorrow. Casual ride with the Mrs.
Today was a nice and easy ride with Alma. I have been wanting to go out riding with Alma for a long while and today was a good opportunity. I had done my long ride yesterday and we nothing planned for the day. So we decided to ride from Mattituck to Greenport, have lunch, and then come back. 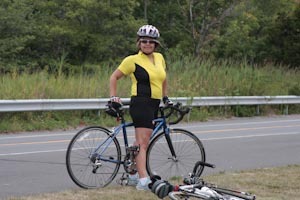 I drove to Mattituck passing many cyclists on the road I was pedalling along yesterday. When I reached the turning point on my 55 mile loop, I started the odometer on the car to see how much further I would need to add to the ride if I went all the way to Greenport from the house. It would add an extra 23 miles for each leg so that would make it 100 mile bike ride. I might try that later in the year. We went along Middle Road which goes by Secret Beach, a place we have both dive a lot but is now unfortunately closed for scuba diving whilst the town/village of Southold wonder how to control access. We passed by many farms and vineyards though there were more vineyards on the way back. Alma just had to get off her bike and try one of the white grapes. I had my camera bag on my chest but I had forgotten to clip on the back strap and the bag was getting in the way of pedalling. I tried to put on the strap as I cycled but I failed – I had to stop. Alma was waiting for me further up the road. It was nice having the camera there though I didn’t stop to take photos except on the way back. We had lunch at Greenport and then we came back on Rt. 25. This went through the villages and there was more pretty houses to look at and even less stops. There were a few inclines, molehills really and the biggest was a bridge going over the railroad track.